The benefits of taking a defensive driving class vary with each organisations, but often include a reduction waiting time to get your full licence test. In some countries, taking a defensive driving course can mean a reduction of up to 10% in your insurance rates for a period of three to five years. With Top Gerar driver training we teach you form of training for motor vehicle drivers that goes beyond mastery of the rules of the road and the basic mechanics of driving. our aim is to reduce the risk of collision by anticipating dangerous situations, despite adverse conditions or the mistakes of others. our students can achieve this through adherence to a variety of general rules, as well as the practice of specific driving techniques. 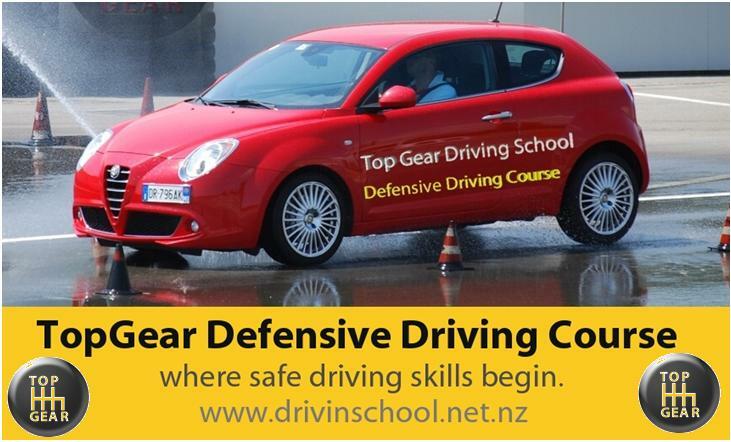 With Top gear The contents of a defensive driving course are regulated and Approved by NZTA and are designed to train you based on the traffic law in New Zealand. The sections below provide a basic outline of the information that is typically covered in defensive driving courses with Top Gear Driver training NZ Ltd.
Losses from traffic crashes have both social and personal impacts. Approximately 600 die annually as a result of traffic collisions, with an additional 10000 injuries. About 38% of all fatal car crashes are alcohol related with another 30% attributed to speeding. Driving under the influence of drugs or alcohol continues to impact thousands of New Zealand drivers each year. While the specific effect of each drug on your body takes place in differing stages, the effect of drivers operating a vehicle while under the influence is disastrous. A very common component of all defensive driving courses is education about the role that drugs and alcohol play on New Zealand's roadways. Topics tend to include the limits as to blood-alcohol level, how your judgment, inhibitions, motor skills and senses are affected by drugs and alcohol and the consequences of being found guilty of driving under the influence. The final portion of many state defensive driving curriculum requirements is specific traffic laws. While for many students this portion serves as a mere refresher course, traffic laws are not always known by all students. And especially in New Zealand , defensive driving courses are taken as a result of receiving a speeding ticket , other traffic violation,or just cutting waiting time to get full licence, relearning these traffic laws can help turn a traffic offender or learners into a good defensive driver.